How did the Horses come to exist? Back in 2000, Lester, the Rockinghorseguy, was working with some of the original giant rockinghorses which were hobbyhorse style horses with a barrel body, stick legs and a hobbyhorse style head. They were very cool, and certainly gave many people many wonderful rides, but they were also starting to need significant repair. Lester began to talk about building new horses, and was told it was impossible to beat the existing horses. Always one to accept a challenge, he had a brainstorm and came up with the idea of creating giant rocking horses modeled upon real horses rather than hobby horses. Lester is an engineer when not bringing to life magical wooden creatures, so before long he had designed the horses and drafted a plan for their creation. He wanted them to be realistic, strong, and utterly awe inspiring, and after far more hours of work than he realized he was setting himself up for, the horses came to be and were everything he ever dreamt they would be... and much more. In more detail, the genius and creator is Les Hartness, the “Rocking Horse Guy.” Les had absolutely no wood working experience at all, as he has been an engineer for over 30 years. He grew up in West Covina California and began attending as a volunteer at Faire in 1999 for an older woman who had three wooden rocking horses (the hobbyhorses described above). They had been built by an out-of-work carpenter. Les spent over a year bringing the horses to life, spending 1,000 hours each on the two current horses, when he was not working his regular job 10 to 12 hours per day. Building them, he wondered just what he had gotten himself into! Approaching from an engineer’s perspective, he started with a plastic model horse, and converting the dimensions, recreated the slices from regular 1-1/8 inch thick plywood. He then assembled the horses block by block (gluing /laminating) screwing and gluing his way to the basic shape. Finely tanned deerhides are used for their saddles. Freya has reins since she's a very sweet filly, but Vlad is a unicorn, and unicorns are not tamable, so he'll never have reins of any sort. 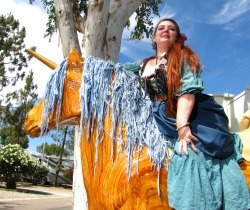 The very fact that he is a unicorn is also why Vlad's mane and tail are blue, in case that question had come to mind. If you see Lester at a faire or event, have him tell you all about his travels to the forests of southwester Ecuador to harvest the entire trunks of a few plywood trees...its a tale well worth hearing! Since their completion, the horses have traveled the country, giving rides and countless squeals of delights from coast to coast. They are most frequently seen in California at Renaissance Faires, but they've also been featured on film, have been special birthday party surprises, and have even been on the Travel Channel with Fred Willard! Yes, Fred went for a rockinghorse ride. These days they are gearing up for all sorts of new adventures, and they'll be making random surprise appearances with Katlinel and Lester throughout the country, so keep your eyes peeled! You too may get to go for a ride and sooner than you think. Lester was born in the sleepy little southern California town of San Bernadino and grew up in West Covina. As he was growing up, he had a fascination with motorcycle racing and spent many a happy hour racing, doing motorcycle stunts and being the best t-shirt and souvenir vendor the Irwindale Racetrack has ever seen. He toured the country doing stunts and taking wonderful up close action shots of racers, developing a taste for life on the road as a performer along the way. After graduating high school he apprenticed to the Operating Engineers and became a full fledged operating Engineer in 1985. His engineering skills were later to come in handy when he designed the rocking horses. The heavy equipment operation skills he possesses came in handy not only for his career, but also early on when he was the magic behind Dinosaurus Rox, a giant flame throwing dragon that toured the country entertaining many and bringing its anti-drug message to the clamoring youth who flocked to see the dragon and wizard from another dimension doing battle daily. Making the transition from that to Rockinghorseguy was a natural next step. Lester will tell you that he's shy when he's not being the Rockinghorseguy, but I think his true self IS the Rockinghorseguy. He is full of life, raucous joy and tender moments of compassion as the Rockinghorseguy--he can go from flirting up a storm with his lovely lady passengers to utterly gentle as he brings a more quiet joy to some of his most special riders: the young man with severe cerebral palsy, the 93 year old woman, the six week old baby boy...they and many like them have had their lives enriched with his passion and joy, and one young man in particular had the entire course of his life changed for the better with his first rockinghorse ride. Moments like that keep Lester going (and glowing inside) even when he's at his most tired after a full day of rocking. Katlinel, the Rockinghorsegal, spent her formative years in the little seaside town of Yarmouth Maine. She spent many a happy hour frolicking in the chill waters of the Atlantic ocean, and from an early age was in love with the ocean and the natural world. She was rarely without her sketchbook, and could often be found outside sketching or painting things that caught her fancy. When not drawing, she was active in the other fine arts, and was an active participant in her high school's drama club, choir and Latin club. With a lifelong fascination for history, it has always been easy for her to immerse herself in a different time period, be it ancient Rome or the Renaissance. When she is not donning the multiple layers and steel boning of Renaissance garb, she can often be found in bellydancing costuming, since she has been consumed by a love of this beautiful and ancient art form for many a year. She has often said that she feels she lives a charmed life, between dance and the sheer joy of bringing the rockinghorses to enrich the lives of those they meet. There is a special magic afoot when someone takes their first rockinghorse ride, and it is a pleasure and honour to be a part of that. Each ride beyond the first is richer and more rewarding--what more could you ask for in life? Yes, the horses have their own mascot...or is that mascat? Yes, the horses have their own mascat. 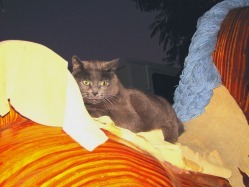 Vermin, our beautiful Russian Blue kitty, absolutely loves to be the official mascat of the horses, and she's one fierce protector of them too! Vlad and Freya quite welcome her attentions, though they did say something about having seen a lot of cowboys and cowgirls, but never a cow-cat. Vermin travels along with us, so you may see her on occasion. Give her a nice ear scritching and she'll likely let you ride in her place.